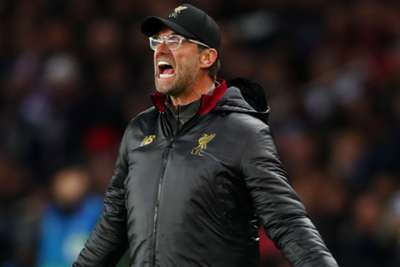 Jurgen Klopp called on Liverpool's fans to produce an electric atmosphere when his side host Napoli in a must-win Champions League clash on Tuesday. Last season's runners-up Liverpool are facing elimination in Group C, needing a win over the Serie A outfit to have any chance of progressing. Liverpool are in some form, sitting top of the Premier League after claiming three successive wins since their defeat away to Paris Saint-Germain. Klopp is eager to see the club's fans lift his side, who suffered a 1-0 loss to Napoli when the teams met in October. "We were not good in Napoli so the first thing we want to do is show that we are better than how we played there," he said, via the Liverpool Echo. "Again, we are going to ask for Anfield and call on the fans to help us – it is a really massive game. "It would be really cool if the crowd was on its feet, it's a big one and our people know that. I know they will already be warming up. "We know how big the atmosphere can be and hopefully we see that. We did everything we could to qualify for this tournament again and we know we have a chance to go through with specific results even though this Champions League campaign so far was not really ours." If PSG beat Red Star Belgrade, Liverpool need a 1-0 win – or a victory by two or more goals – against Napoli to progress.